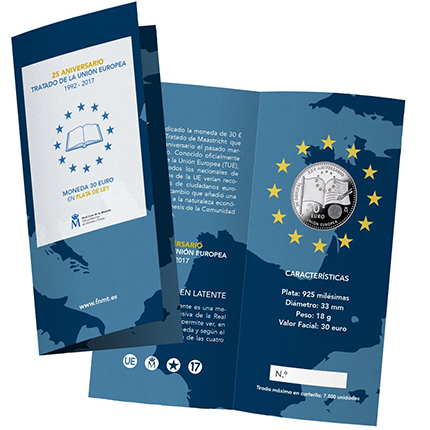 The Fabrica Nacional Moneda y Timbre–Real Casa de la Moneda have launched (5th June) their annual-issue silver face-value commemorative coin. This year the coin highlights the 25th anniversary of the Maastricht Treaty—the agreement which established the European Union, successor to the European Economic Community, which was in force from 1957 to 1992. The reverse design depicts a stylised flag incorporating the shape of the treaty folder as well as an ink pen superimposed over the treaty. The insignia of the European Union, a circle of 12 stars—signifying the original 12 member states who were also signatories to the treaty—overlaps the top of the stylised flag. 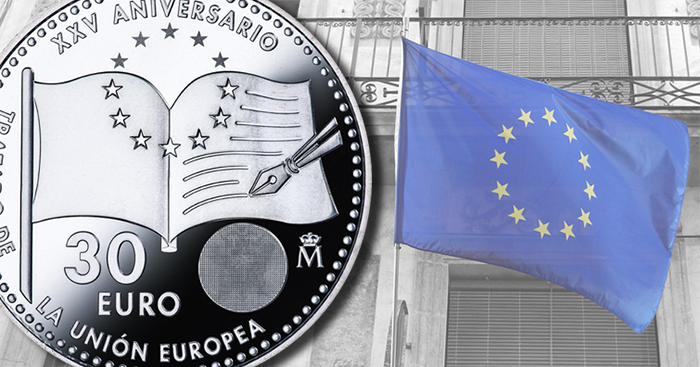 Below the flag to the right is a circular, quadruple latent-image application which, when the coin is tilted, alternately shows the letters UE, for Unión Europea (Spanish for European Union); a five-pointed star representing the 12 stars of the EU; the crowned letter M, which is the Real Casa’s mintmark; and the number 17, for the year of mintage. The denomination 30 / EURO, in two lines, is to the left of the latent image, while the crowned M mintmark is to the right. 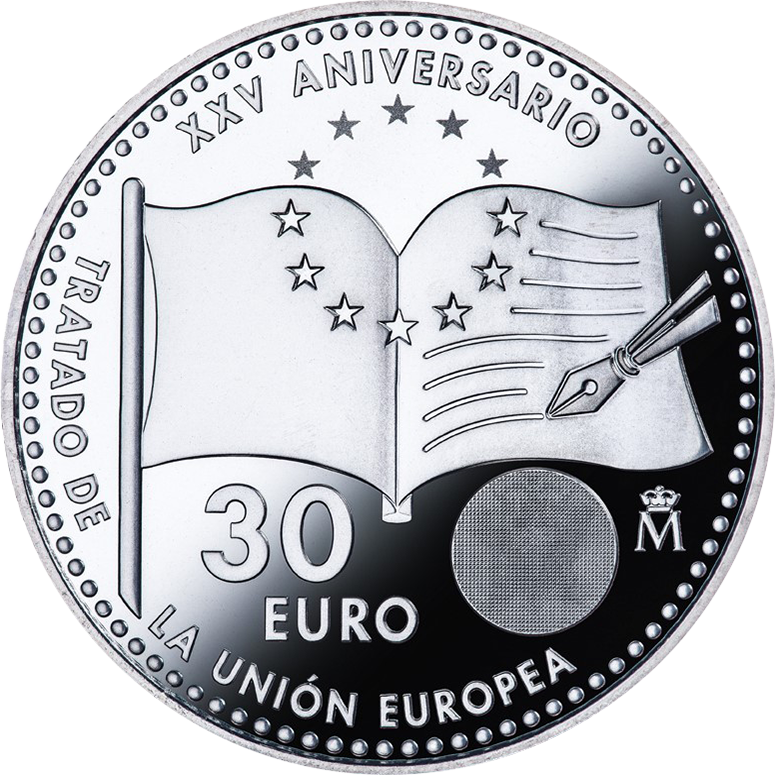 The surrounding legend is in two parts: at the top, XXV ANIVERSARIO (25th Anniversary); and, reading clockwise from about 10 o’clock (and divided by the flagpole), TRATADO DE / LA UNIÓN EUROPEA (Treaty of the European Union). The design is surrounded by a beaded border. 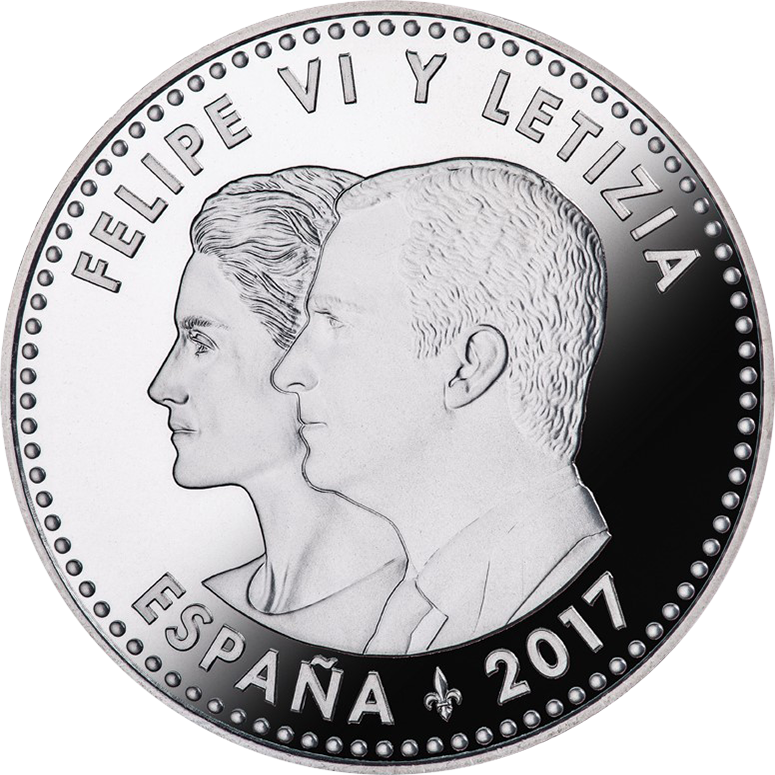 The obverse side shows the conjoined, left-facing effigies of HM King Felipe VI and HM Queen Letizia, along with their names, FELIPE VI Y LETIZIA, above, and the text ESPAÑA 2017 below. The reverse design, too, is surrounded by a beaded border. The annual coin issue is available at face value from the usual commercial and/or retail outlets such as banks and post offices. A Brilliant Uncirculated version is also available from the FNMT–Real Casa in a numbered blister-pack folder. Please visit the website of the FNMT–Real Casa for additional information on this coin. 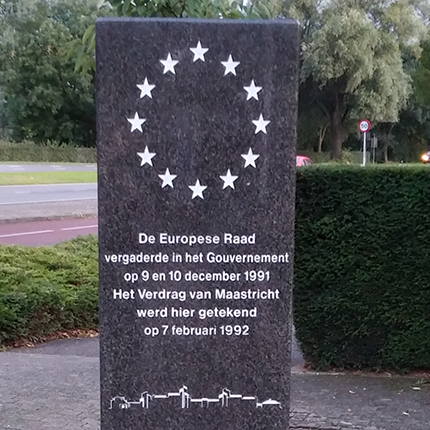 The Maastricht Treaty is the successor to the Treaty of Rome, which established the European Economic Community from what had been known as the European Coal and Steel Community (ECSC). The ECSC was an unprecedented concept proposed by Jean Monnet, a senior French civil servant, and supported by Robert Schuman, then–foreign minister of France. The momentous proposal was conceived literally from the ashes of the Second World War to accomplish two primary necessities—management of vital and needed commodities to rebuild the continent, and closer economic cooperation between former enemies France and the newly established West Germany. Before long, Belgium, Italy, the Netherlands, and Luxembourg also joined the negotiations. The six nations became founding members of the ECSC, which was formally established by the Treaty of Paris in 1951 and came into effect on the 23rd July 1952. The success of the close economic cooperation between these founding states resulted in still further legislative and judicial cohesion with the signing of the Treaty of Rome on the 25th March 1957 and establishment of the European Economic Community (EEC). The Treaty of Rome resulted in a more formal association between member states and paid specific attention to a possibility for expansion in Western Europe as well as concentrating on stronger democratic principles and on social and cultural integration. Significant change to the structure of to the EEC seemed necessary after the fall of the Iron Curtain on the European continent in the late 1980’s and the collapse of communist governments one after another in Eastern Europe. In 1990, the proposal for a greater European community which would integrate the countries of Eastern Europe while also supporting countries who reestablished their independence from the Soviet Union (such as those in the Baltic region) was underway. The Maastricht Treaty did just this, recognising that a return to democracy (or the initial conversion to one, as was the case of some countries in Eastern Europe) should be encouraged with economic support and inclusion into the EEC. The then-current member states negotiated a new agreement, which was seen as a roadmap to closer integration and a geo-political plan to take the European Community into the 21st century. The agreement was signed on the 7th February 1992 in the City of Maastricht in the Netherlands, which also hosted the European Council—responsible for drafting the treaty itself in December 1991. The treaty came into effect from the 1st November 1993 and was in effect until it was amended by the Treaty of Lisbon, known as the Reform Treaty, in 2009. In 1981, Greece became the 10th country to be admitted to the EEC, followed by Spain and Portugal in 1986. In 1995, Austria, Finland, and Sweden were admitted into the new EU rather than the EEC as the 13th, 14th, and 15th members, respectively, paving the way for the first of the Eastern European states to follow. The largest accession of new member states occurred in 2004 when 10 countries, many of them previously behind the Iron Curtain, formally joined the EU during a ceremony in Dublin which took place on the 1st May. The European Union was now an organisation of 25 members with more countries set to join in the near future. In 2007, the countries of Bulgaria and Romania were admitted as the 26th and 27th members, which meant that the EU’s southernmost member, Greece, would now have continuous borders with other EU member states for the first time since they joined in 1981. Croatia became the latest to join when they were admitted in 2013. Albania and Montenegro (a former republic in Yugoslavia) are scheduled to become the newest EU members before the end of the decade. With regard to the issue of leaving the organisation, to date this has occurred only once, when, in 1985, the territory of Greenland attained home rule from Denmark and voted to leave the EEC, using its new legislative authority to withdraw from the community. More recently, a non-binding referendum to decide on continued membership in the EU was called for by voters in the United Kingdom in the wake of closer integration of immigration and trade policies. On the 23rd June 2016 the British public voted in favour of BREXIT—an exit of Britain from the EU—by a margin of 52% to 48%, triggering the necessary exit legislation. The official date for this formal split is thought to be two years from the day the British government advised the EU commission of the country’s intention to leave the European Union, which took place on the 16th March 2017.